On Saturday the husband and I ran the 3rd annual Anthony Wayne Rotary 5K which took place at Shoaff Park here in Fort Wayne, Indiana. The course is all paved and a simple double loop around Shoaff Golf Course. The only race “swag” was a cotton T-shirt, although the design was not bad. While still a relatively new race, this year the event clearly had great marketing behind it, as participation nearly doubled compared to last. I went into this race hoping to defend my “title” which was 3rd place in my age group last year. While I wasn’t able to defend it, I set a course PR and ran my first ever “barefoot” 5K. I raced for the first time “barefoot” in my Vibram FiveFingers. I opted for this particular race because I have now comfortably ran nearly five miles in the shoes, so I knew that the 5K distance wouldn’t be an issue. Secondly having ran this race last year I knew the course was paved and proved a lesser risk of ankle-twisting. Overall the barefoot racing went great. I literally had no complaints. My pace was a bit slower than I would have liked. Don’t we all want a PR? But it was hard for me to attribute the slower pace entirely to the shoes. Could have been the newness of racing in the shoes, but also the weather, which I’ll talk about more in a moment. Parking was easy and close to the post-race refreshments. Water, bananas and cookies were offered up, and we had the first two. The race was well-organized for the most part and the post-race prize drawing started right on time. It looked like a local radio station was on-site and so during each loop of the course I was able to hear some jams which helped me keep going. Check that ring of sweat! The only logistical issue was a locked gate on the race course. Instead of allowing runners the normal eight to 10 feet of roadway the gate was closed so we had a two-foot wide space to run through. I had an issue just because as I was finishing I literally almost ran into a walker as he was going through the gate. I had to veer around him to get through without stopping. I griped most about the weather which was very high humidity and sun at race start. Please note the ring of sweat on my tank. I would run this race if given the opportunity again and would recommend this race to others. I was initially disappointed with the number or runners because of my hopes to defend my title. However, the race proceeds go toward charity to help eradicate polio in foreign countries, so I am happy the organizers probably received a much larger donation this year.Read my 2010 Anthony Wayne Rotary 5K recap, including my age group award, here. 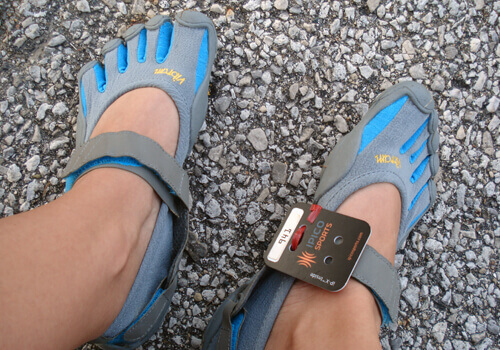 Do you have questions about the VFF shoes? Congrats on your course PR! Great job on your first VFF race! 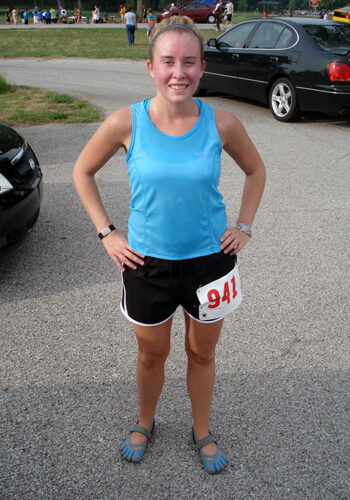 Congrats on your first “barefoot” race! My husband and I had a VW bus just like that one! Awesome! Back in high school I actually really wanted a vintage VW bug. Never got one. The love buses are so cute though! Haha! Nice race! I have a pair of VFFs, but I’m always afraid to actually run in them. When I wear them to work the bottoms of my feet get incredibly sore. Does that happen when you run? Congrats on such an awesome race, and your first one in Vibrams! I have yet to do a race in my pair. I’m hoping to do a 5K next spring while wearing them. I like yours because they contain a nice contrast of blue, my favorite color!